Right after we got to Savannah with Ethan and Aaron, there were immediate requests for rides on the dinghy and the motorbike. As Sue informed me “we got these things and we’re dragging them with us everywhere we go, so get them down and start using them.” We’d been too busy getting out of Florida to mess with them before. 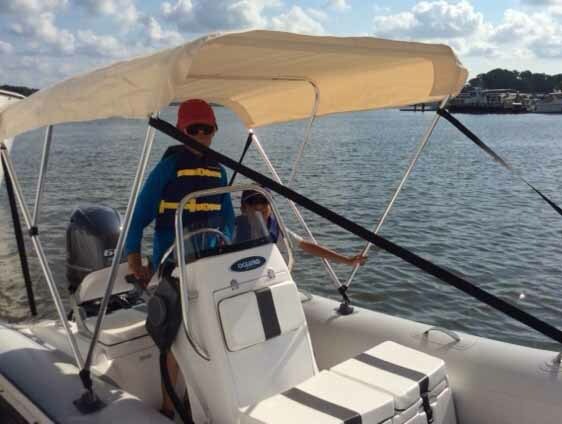 The main “inconvenience” of loading these items is that the port side has to be toward the dock to load the bike and toward the water for the dinghy. The motorbike went down first and Ethan and I went out of the marina and north, where we ran into Bonaventure cemetery which was huge and a great place to see. I took Aaron out that way also. 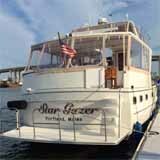 A few days later we took the dinghy out on the Wilmington river to the main Savannah channel. I had to bring along our iPad with its navigation programs to not get lost on the various intersecting channels along the way. It has a waterproof case but if I ever drop it in the drink it will sink like a rock. Huge container ships passed us in the main channel. Because they are so big they appear to be going slow, but they normally move faster than our big boat can go and can be a real hazard. Getting too close can trap us in the turbulence their hulls and huge props make. These days we might be mistaken for a terrorist boat loaded with explosives if we get too close. Since 2001 we have to stay at least 100 yards from any naval vessel or face a “quick, determined and severe response” (dept. of Homeland Security words, not mine). If anything appears amiss within 500 yards, like going fast, the same applies. To avoid anyone getting the wrong idea about our intentions, we stay away from cruise ships and port areas as well. We passed this Trident sub base. The nearby boat is for the quick, determined and severe response. The kids had fun driving the dinghy. 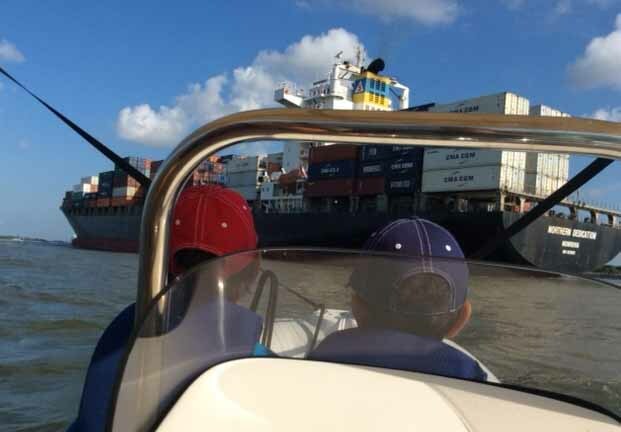 Driving our big boat is not as much fun for kids, since it is mainly just holding the wheel in the same place, or more likely just watching for crab pots or other hazards while the autopilot holds the wheel in the same place.